The auditing tool isn't enabled or visible by default. Before you can see the auditing tool or make auditing configuration changes, an administrator must give you the auditor or auditing configuration role. Auditing configuration: Users with this role can configure what gets audited. This role also includes the auditor role rights, so users with this role can also see the auditing tool and view auditing data. Auditor: Users with this role can view auditing data and create auditing custom queries, but they can't change what gets audited. Click Tools > Administration > User management. In the Roles tree, double-click Auditing configuration. On the Users and groups page, select users that will have the auditing configuration role. Have the console user that you gave the auditing role restart their console so that they can see the auditing tool. A user's rights and roles are loaded once when the console starts, making a console restart necessary. Click Tools > Configure services. In the Configure Ivanti software services dialog box, click the Auditing configuration tab. If you don't see this tab, make sure you have the auditing configuration role and that you've restarted the console after being assigned that role. Select the console features or sub-features that you want to audit. Click Tools > Administration > Auditing to view the auditing data. 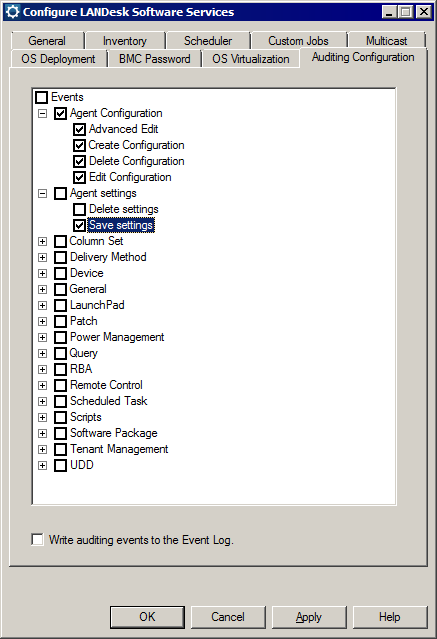 NOTE: It can take up to two minutes for changes to the Write auditing events to the event log option to take effect. You can restart the console if you don't want to wait. In the Roles tree, double-click Auditor. On the Users and groups page, select the users that will have the auditor role. Have those users restart their consoles so that they can see the auditing tool.